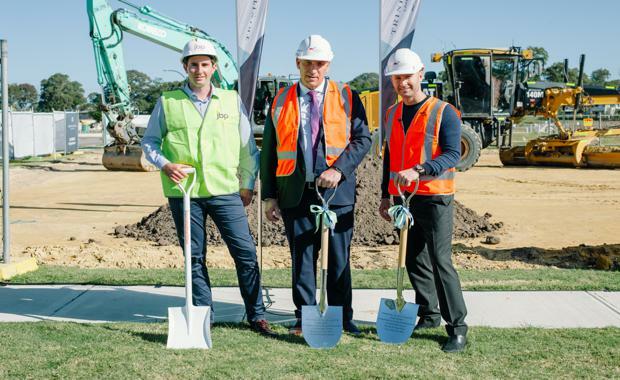 Former Australian cricket test captain and ambassador for Trinity Point, Michael Clarke joined Johnson Property Group’s Keith Johnson today in celebrating the start of construction of 8 luxury terraces at the company’s $388 million masterplanned community situated on Lake Macquarie. Terraces will be available featuring two, three and four bedrooms and ranging in size from 192 to 256 square metres, priced from $1,088,888 and $1,328,888. All terraces feature balconies for outdoor dining to take in the peace and tranquillity of Lake Macquarie. Clarke was the first to purchase within the estate, buying a four bedroom, three storey luxury terrace in November last year which he purchased for $1,388,888 million. At that time, he also came on board as an ambassador for the project, joining Newcastle "local" Jennifer Hawkins. Johnson Property Group has now launched stage 6, which comprises 23 land lots. As the largest blocks to be released to date at Trinity Point, Stage 6 lots range in size from 500 to 852 square metres. Building on the success stage 2 lots are expected to attract high demand. Many blocks are ideally situated with filtered water views, within a minute’s walk to exclusive lakeside amenities including a 5 star Pullman Hotel, a 200-seat restaurant and 300-seat function centre, a 188-berth marina and a wide range of resort-style facilities including a luxury day spa, infinity swimming pool and gym. This will make them particularly attractive to discerning buyers wanting an exclusive marina resort lifestyle all year round. Buyers can choose from a range of solutions to design a bespoke home to suit their lifestyle and parcel of land. Options include designing the house around a luxurious pool and spa or a lush private garden, complete with fluid indoor-outdoor living, entertainers’ kitchens and parents’ retreats. All blocks are ready with NBN, underground power, natural gas, Hunter Water mains and sewerage connections. Johnson Property Group is one of the largest private developers of residential land in New South Wales. The company controls approximately 7000 across the state.